A backyard patio paved with concrete pavers, installation by BR Landscapers. BenefitsConcrete pavers are a great option for patios because they are durable, slip resistant and can provide the look of natural stone. They also come in a wide array of colors, shapes and sizes, permitting you to create design schemes that complement your home and landscape. You can also use the pavers to build raised seat walls, pillars or planter boxes that will coordinate with the patio itself. Another advantage of using pavers for patios is that they can be spot replaced, if necessary. Also, if you want to add on to your patio at a later time, it’s easy to add matching pavers and create a seamless transition. 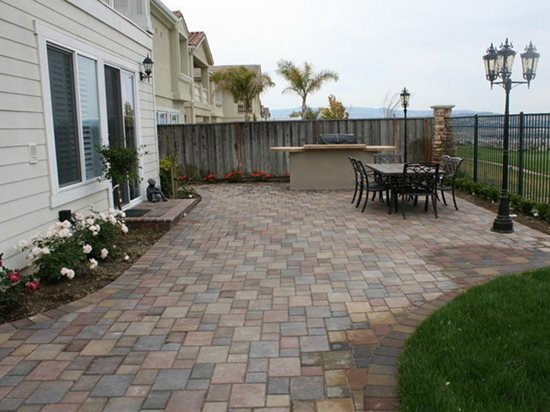 One drawback of pavers is the cost, which tends to be higher than stamped and colored concrete. However, they offer great long-term value because of their ease of maintenance and resistance to cracking and settling. “The cost between pouring slab concrete and installing pavers is only a difference of a few dollars or less per square foot. 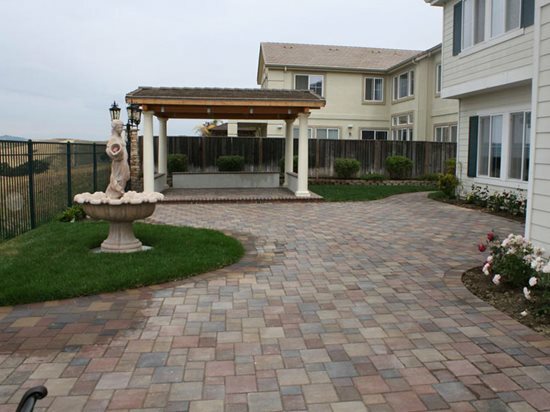 The long-term benefits of pavers over concrete is realized in the reduced costs to replace or repair,” says Brian Ramirez, owner of BR Landscapers of East Bay, Tracy, Calif. Maintenance of a paver patio is as easy as sweeping and rinsing, installation by BR Landscapers. Typically, the only regular maintenance required for a paver patio is sweeping and occasional rinsing to remove dirt and leaves. Concrete pavers may settle in spots over time if they aren’t installed properly over a stable subbase. However, they can easily be reset with no noticeable patchwork. Simply remove the affected pavers, regrade and recompact the subbase, and reinstall the pavers. To ensure the best performance, use a minimum of 6 to 8 inches of well-compacted base material and a 1-inch sand setting bed when installing paver patios. Keep your patio cooler by avoiding the use of dark-colored pavers, which will absorb more heat. To prevent tripping hazards, be sure to use pavers with beveled edges. For added ambience at night, consider installing light fixtures along the patio edge or integrate a lighting system into the pavers during installation. There are a number of factors that can increase the cost of installing a paver patio, according to Ramirez. “The specific design or variation of design, color blending of materials, type of paver, complexity of cuts needed to accommodate the design, and size of the project are all considerations that can inflate the cost,” he says.